Heat the oil in a pan – I used a non stick wok – and fry the onion and carrot until both are soft and the carrot lightly browned. 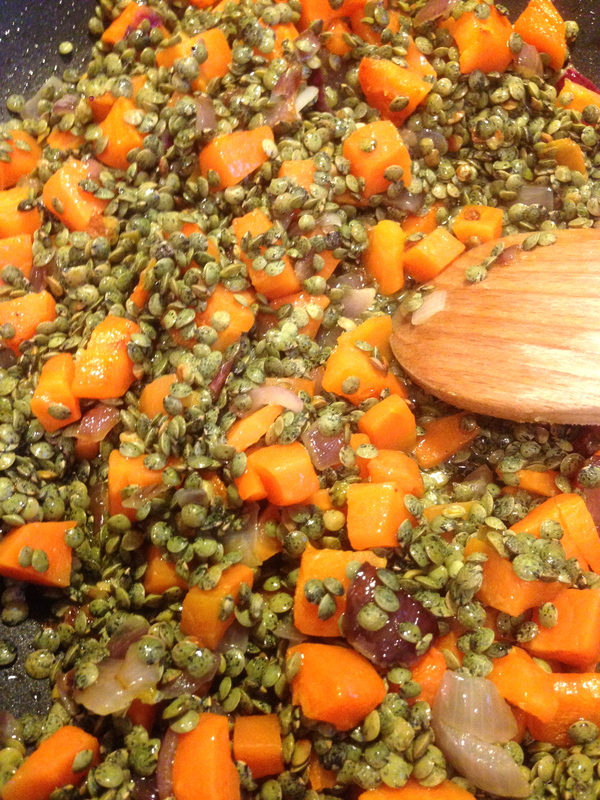 Lower the heat and simmer for around 35 – 40 minute until the lentils are just soft. Season with a little salt. Cook the pasta. Whilst this is happening remove half the lentil mixture, including liquid and add to a blender. Blizt to a puree. Return it to the pan. Stir it in along with the crème fraîche and the balsamic vinegar. I then pan fried the lardons separately and added them also. This is a really cheap and satisfying dish. It tastes, as Nigel Slater says, wonderfully ‘earthy’ and I cannot tell you how amazing the flavour is considering how basic the ingredients are – it is a marvellous example of the the alchemy of food! This is a recipe created by the marvellous Nigel Slater and it appears in his wonderful new book – Eat. Like all great meatball dishes you can play around with the idea – adjusting quantities, ingredients to suit your taste / mood. This was my attempt and I was pleased with the result – it is a different way to cook them – and simple yet succulently appealing to the senses. Put the sausage meat in a mixing bowl and stir in the rosemary, lemon zest and crushed garlic. Shape into small balls – I got 16 decent balls, slightly smaller than a table tennis ball. 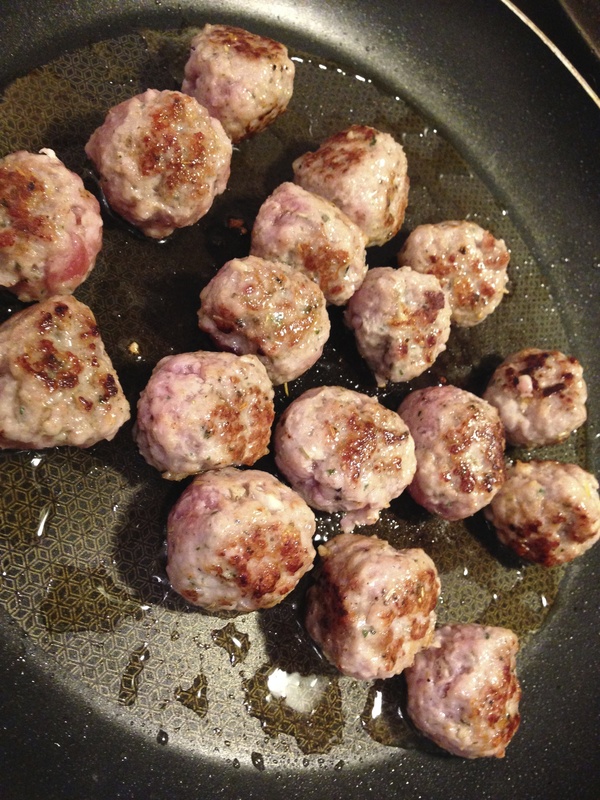 But you can make them smaller if you fancy.Cook the balls in the olive oil over a moderate heat until evenly browned. Get rid of any excess fat, then pour in the stock. Bring to the boil and let it reduce a little. Add the cream and stir in, plus the mustard. Season with a little salt and a bit more pepper. Continue to cook for about 15 or 20 minutes, stirring gently every now and then. Remove the balls to a warm plate with a slotted spoon.Turn the heat up under the sauce and let it reduce a little. It will not thicken though. Pop the meatballs on a plate of warm pappardelle and pour over the velvety sauce. 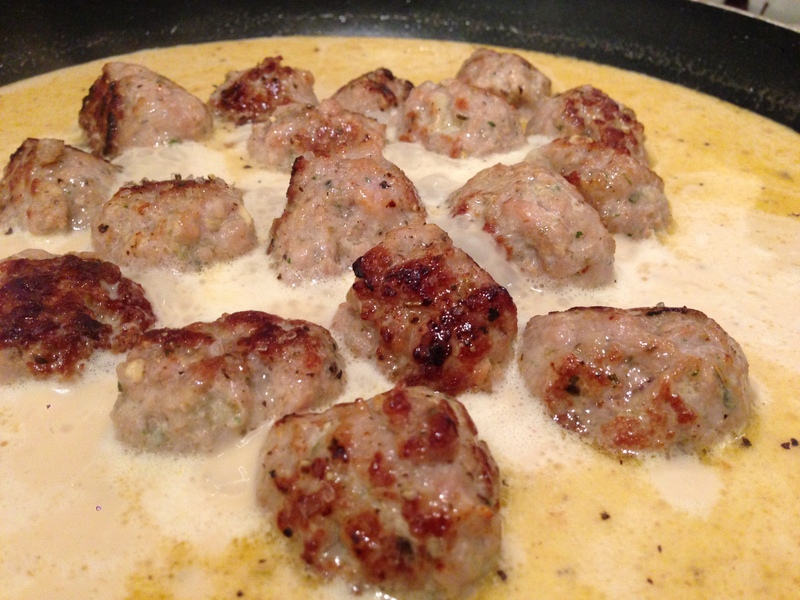 You could miss out the cream and stock altogether and just pan fry the balls in olive oil then add butter and lemon juice to the pan juices at the end, pouring these over the balls and pasta. Tis up to you! Happy New Year! A tasty way to bring in 2014! Last night was a joyfully easy evening – good company, good wine plus tastes and flavours to salivate the soul. 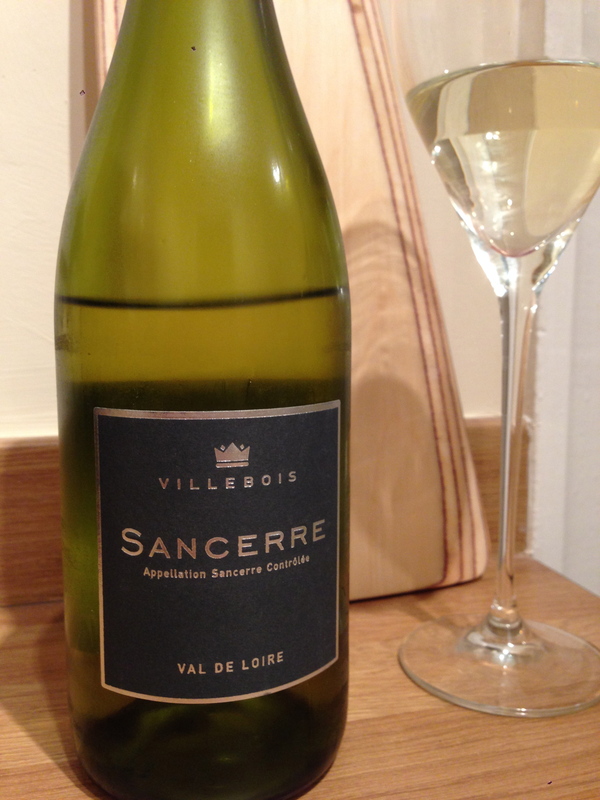 It began with a nice, crisp and fruity Sancerre whilst we waited for my good friend Annie’s starter to appear – gorgeous medjool dates stuffed with stilton and wrapped in parma ham, drizzled in olive oil and baked in an oven at 200c for 20 minutes til crisp and unctuous. 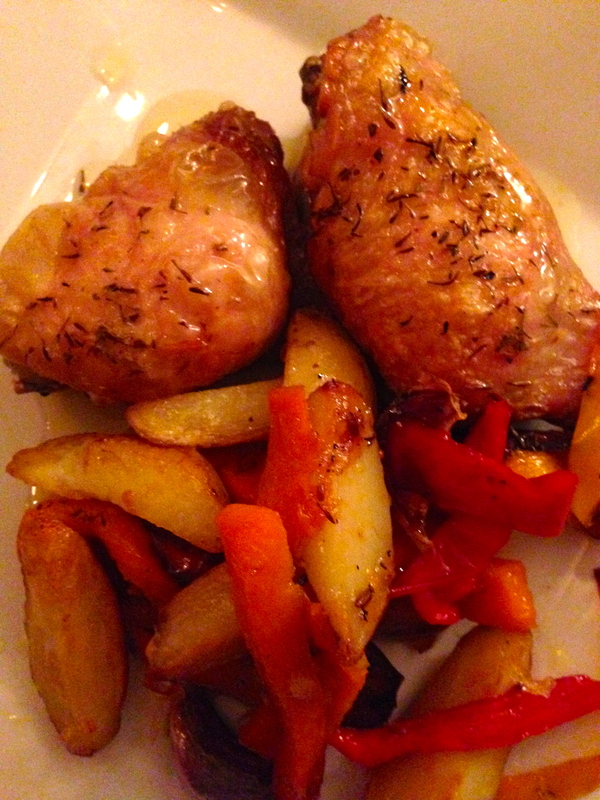 Main course was based on a recipe from Nigel Slater’s new book ‘Eat’ – highly recommended! 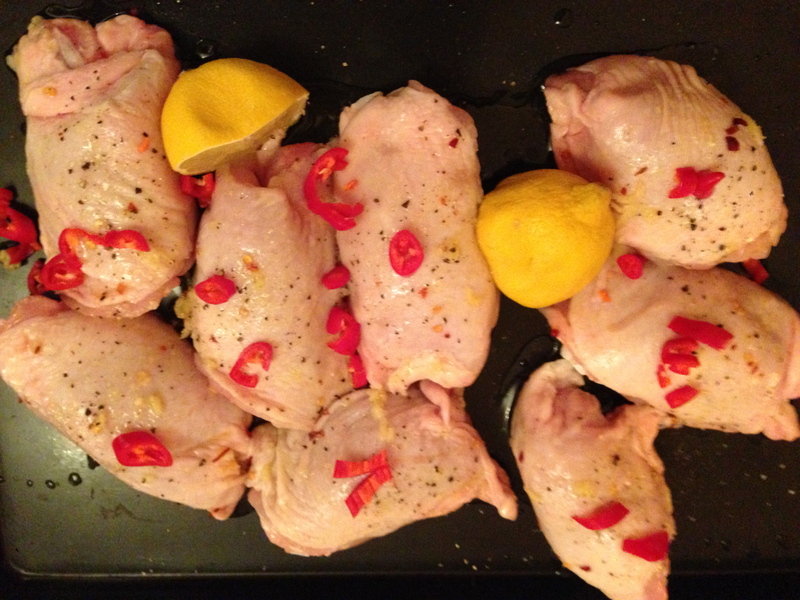 Chicken thighs marinated for an hour in olive oil, dried chilli flakes and crushed garlic, roasted in the oven at 200c for 30 minutes – I added more fresh red chilli to Nigel’s recipe and a little squeeze of fresh lemon. I baked potatoes, and when they were ready, split them, scooped out the flesh and mixed it with butter and grated parmesan – popped them back in the oven for 5 minutes once the chicken was ready. Best part was the silky cannellini bean dish. 2 x 400 gm of cannellini beans in a pan with 200 ml of crème fraîche – warm it through then add a little salt and a couple of grinds of black pepper. Mash with a potato masher and serve with the chicken and spuds. Dreamy…really dreamy! The gorgeous juices left over from the chicken I put to one side and used as the base for a New Year’s day vegetable soup. 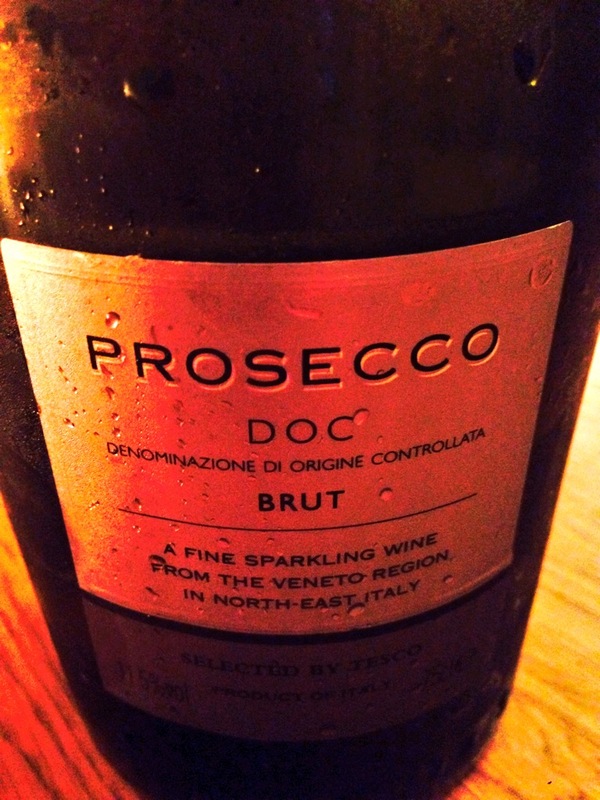 I kept to white last night – prosecco, champagne and Sancerre. 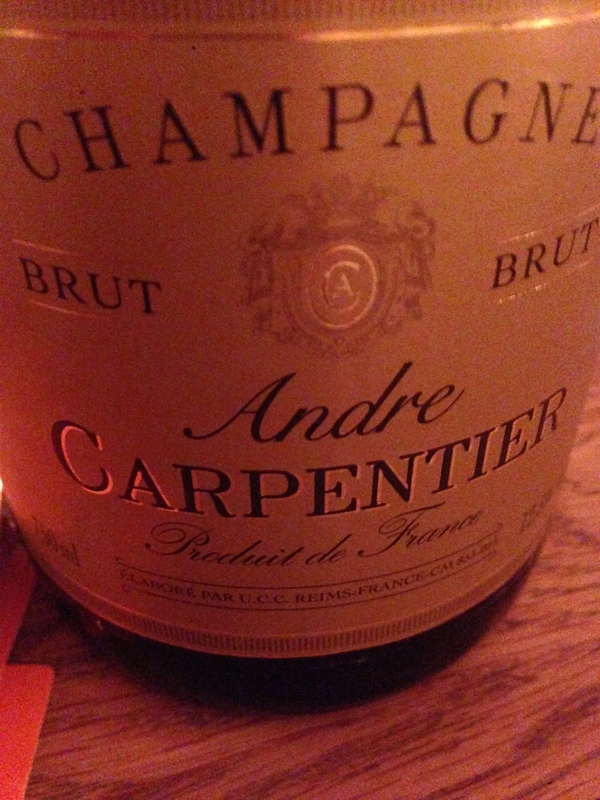 I enjoyed every minute of the evening – and the simple supper sumptuously eased in the new year. Have a great year everyone! So many recipes to look forward to – so much to share! Cheers! I was going to call this Autumn is cumin in…but that was just too naff…so as the Kinks were on the i pod it ended up as you see above…and this dish is everything that is good about autumn…it is lightly spicy..courtesy of the cumin…it is wonderfully colourful (the squash simply exudes bonfires and mellowness) with a regalia of autumnal colours, yet still with the lingering flavours of a Med summer, courtesy of the peppers. Tonight’s supper is in many ways, thanks to Nigel Slater – no he did not drop round and cook with me – sadness pervades – but I was curled up in front of the fire reading his Kitchen Diaries 2, the October section, and I was just inspired to cook something redolent of autumn – and to use up the half of butternut squash that was whistling dixie in the fridge. So, I peeled the squash, and cut it into chip like strips, then cut up one long red and one long yellow pepper into similar size strips. Popped these on a baking tray with 5 or 6 cloves of unpeeled cloves of garlic. Then drizzled all with olive oil and a good sprinkling of cumin seeds. The chicken thighs I places on another tray and scattered each with lemon thyme salt and olive oil. I then took some rather pleasant new potatoes and cut them into chips, and bathed them in vegetable oil. I put the pepper / squash tray into the top oven at 200c and the chicken and the potato chips into the bottom oven, same temperature, for 40 minutes. The congruity of these ingredients must also be remarked upon – because they all kindly cooked at more or less the same time. I drained the potato chips, drained the chicken jus into a pan, then added the potato chips to the chicken thigh tray and popped them back into the oven – turning the heat off; the skin of the chicken was deliciously crispy by now. I removed the peppers / squash tray and left them on a rack to wait patiently for their moment. I added a little chicken stock and hot water to the jus to make a zingingly tangy salty jus that would compliment the whole dish perfectly. I removed the chicken thighs from the oven, added the squash. pepper and garlic to it and served it at the table. Jus was drizzled over by request. The flavours were phenomenal – simple as that – the cumin wedded with the butternut squash was mouth-fillingly vibrant. The whole ensemble was simple, cheap and autumnal – colour wise – flavour wise and fragrance wise. I felt so relaxed and mellow after eating this – it hit all the spots in the right order and, along with a smoky South African Merlot, reminded me why I am alive. Oh, and thank you Nigel for the inspiration! Now there’s a surprise from Nigel…. I am very fortunate to have the mighty and magnificent Nigel Slater following me on Twitter – I was chatting with him this morning re my breakfast – see previous piece – when he replied as above – and he does not like eggs! How about that! But he did like my photo which made me feel ten foot tall…but clearly can’t tempt him with an oeuf of any kind. 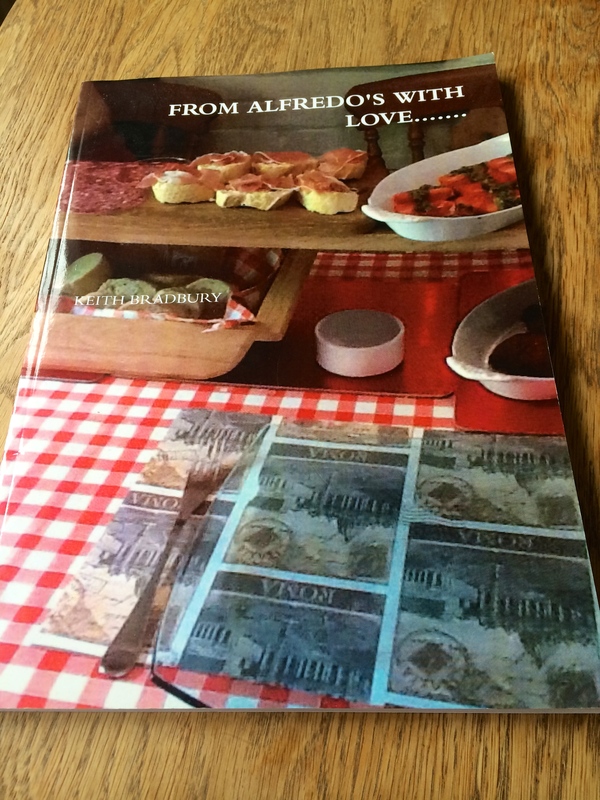 But he is a black pud guy which is ok with me – and he did remind me later of his excellent recipe in Kitchen Diaries Volume 2 P 146 (if you have not got this for goodness sake why not – go and buy it now! ) for black pudding in pastry with a mustard sauce. It looks and sounds fab. Right – that’s enough twittering from me for a while. Off to enjoy bank holiday Monday. Out for lunch – then back home to experiment with home grown rhubarb and strawberry vodka for dessert this evening! Tonight when I got in from work, sun still shining, I whizzed up a smoked mackerel paté – an easy peasy paté that hits the spot every time. 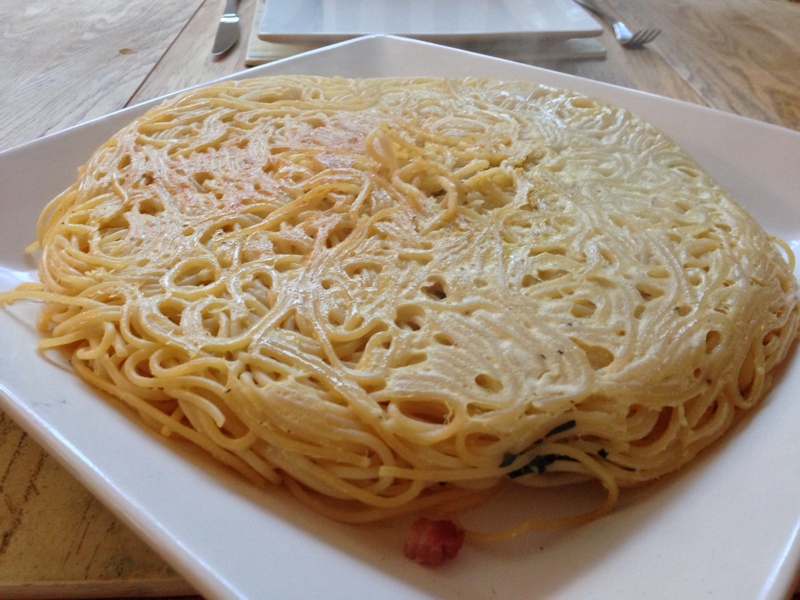 I think it was originally from a Jamie Oliver book – the 30 minute meal one. You must do it – though I would be amazed if many of you out there have not had a crack at this. All you do is get your food mixer out. Then take 3 fillets of peppered smoked mackerel – break them up and add to the mixer, along with 200 gm of soft cream cheese, a good dollop of horse radish, zest and juice of a lemon and a handful of chopped flat leaf parsley. Whizz it all to some good music for about 2 minutes. What emerges is an unctuous cream of a paté. Fridge it for half an hour – then just before you serve it, drizzle a little olive oil over it and serve with toast. Once we had come to terms with the loveliness of this, sat back, imbibed a glass or two of rosé, I served a very simple Nigel Slater inspired dish as in the pic above. Simply add a splash of olive oil to a frying pan, add a chopped clove of garlic, a handful of sweet red cherry tomatoes and a sprig of chopped fresh rosemary- I throw in the sprig after too. Fry gently til the toms start to fall under a gentle prod. Add a little fresh cream, a little rock salt and some black pepper. 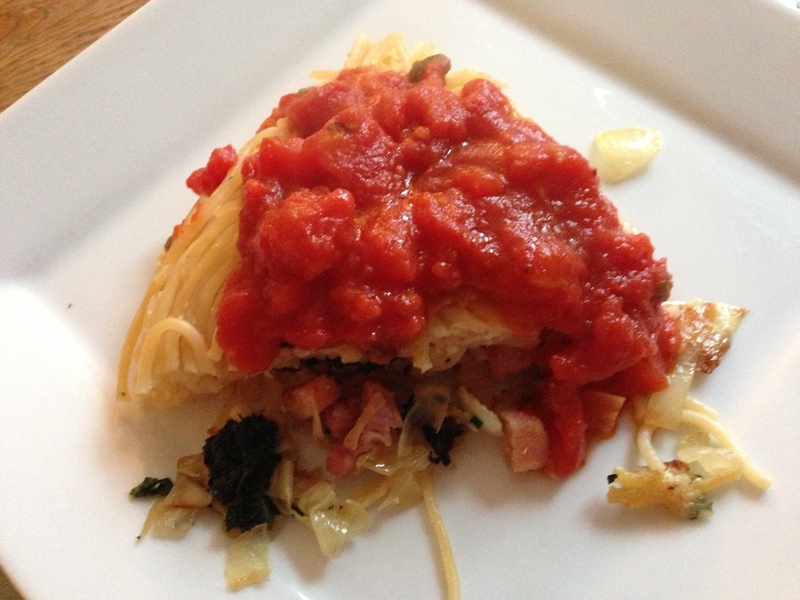 Serve with fusilli pasta. So good. A perfect simple supper. Was whisked back to my youth yesterday when someone on Facebook posted a T.Rex video of a TOTP performance of Get it On. I was as much mesmerised by the appalling outfits the audience were wearing as I was by Marc Bolan making love to the cameras with his Gibson Flying V guitar and under eye glitter. I hope I didn’t dress like that..I fear I may have done! It was a good day yesterday, not least because Nigel Slater tweeted to say he had looked at this blog and liked it. He was taken particularly by the Flat Bread idea. To say I was chuffed would be a gargantuan understatement. My Twitterati friends made me shine too, especially those who spread the word about this tiny planet in the mighty Blogosphere. Thank you all. Today is a planning day – family descend tomorrow for 5 nights. Menu all sorted. Meat ordered from Parsonage Farm – going to drop in there Saturday morning to collect – also just to soak up the atmosphere. If you live in Hampshire – visit! Website at bottom of blog with address. Will put recipes up for coming days soon. Thinking about doing a Lemon Spiced Chicken with chickpeas tomorrow, then a 3 veg linguine Thursday. Friday, I fancy making paella. They are curry fans, so possibly an Indian lamb dish Saturday. Sunday, considering a hearty ox tail stew in Guinness with spinach dumplings. I think I’ve seen Mr Oliver cook something along those lines. Have spent too many hours on Spotify this holiday – but it’s been worth it – am listening to some wonderful bands whilst fiddling in the kitchen – The Lumineers, Fossil Collective, The National, Death Cab for Cutie, Bastille, Damien Rice, Black Keys and so on…I love the Latin Radio station too…makes me feel like I’m cooking in Spain! Right – off to write the shopping list – then a shower – then to the food shops!! Yes! Oh, and the sun’s out!